As olive oil gains more and more popularity due to its exceptional health characteristics, why not take some time with friends to learn what types of olive oil you and your family prefer? Hosting your own olive oil tasting party is simple, fun, and informative. It’s ideal for an outdoor barbeque, and equally enjoyable on a cold winter’s night. We asked Nancy Ash, one of the most respected tasting experts in the United States, to write a post about tasting for The Olive Oil Source. 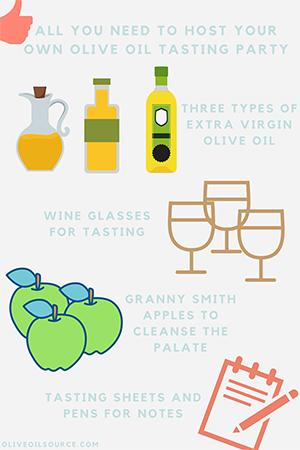 You can find the full text of her olive oil tasting advice here and we encourage you to read it carefully. Nancy recommends starting with just three olive oils. You’ll want to select extra virgin olive oil, and include one that is an inexpensive imported supermarket brand. For the remaining two, we suggest trying one of our own – such as The Olive Oil Source Italian Blend Extra Virgin Olive Oil, plus one of our single varietal olive oils such as The Olive Oil Source Arbequina Extra Virgin Olive Oil. Another affordable option would be one of The Olive Oil Source Samplers – then you’ll have alternatives for additional tastings. Even though professional tasters use colored tasting glasses so that they cannot be influenced by the color of the oil, wine glasses also work great for tasting, so you don't necessarily have to purchase special tasting vessels. Additionally, only about one tablespoon of olive oil per pour is needed. Cleansing your palate in-between samples is a must. Nancy recommends a simple slice of a tart Granny Smith apple. Finally, your guests will need tasting sheets and writing implements with which to jot down their tasting notes. We illustrate a number of olive oil tasting sheets here. NOTE: These tasting sheets are for professionals. We generally recommend that beginners just rate fruitiness (the aroma), bitterness (on the tongue) and pungency (in the back of the throat), as well as balance among the three (you don’t want an oil that has a very strong aroma and no bitterness or pungency, for instance) on a scale of 1 to 10. Follow Nancy’s advice for tasting and take notes on your tasting sheets. Enjoy compiling and comparing the results of your tasting. Over time, you’ll be able to dial in your preferences and detect nuances across various types and varieties of olive oil. If you want to add a little something extra to your party, you can provide your guests with olive oil and/or vinegar party favors. The labels can be personalized to commemorate your event. You’ll want to order about two weeks prior to the event, unless you want to expedite your order.